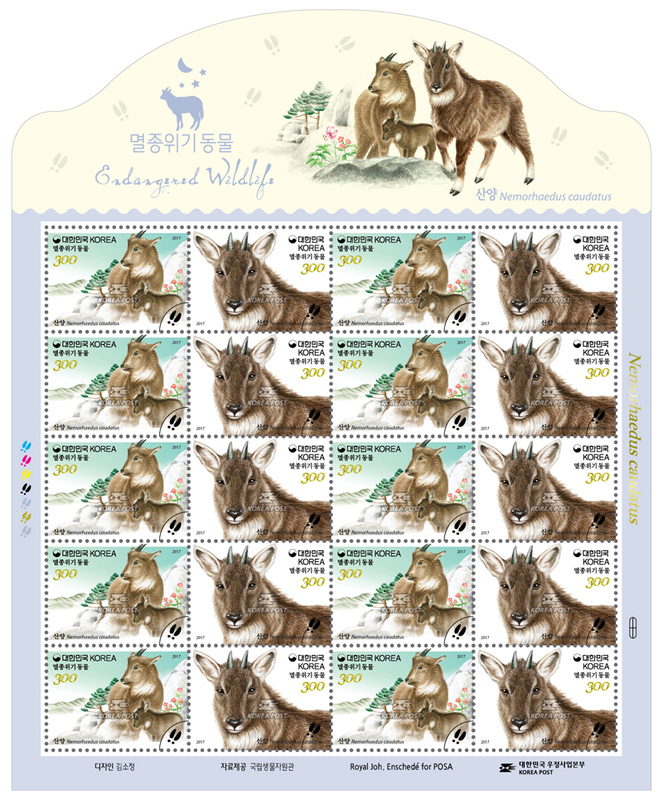 Korea Post has been issuing special stamps in series to raise awareness of endangered wildlife. This years set introduces the goral, which is Natural Monument No. 217. The goral population has plummeted since the Korea War due to excessive hunting for medicinal use (oriental medicine), food, or taxidermy. 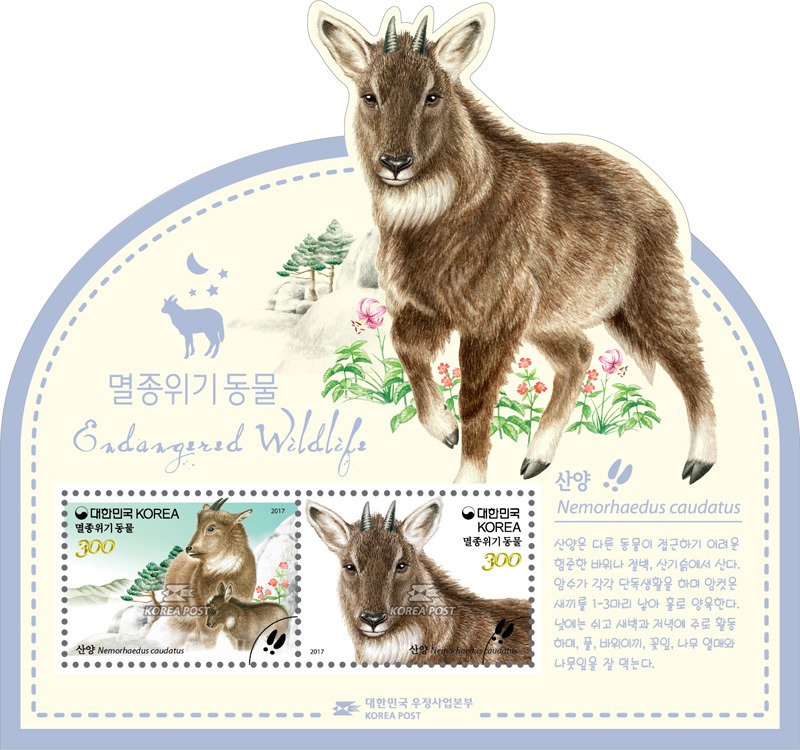 The Ministry of Environment designated the goral as endangered wildlife in 1999 and has since protected the species, Because the Korean gorals appearance has hardly changed since it first appeared on Earth some two million years ago, it is often referred to as a living fossil. Though somewhat similar to goats and sheep, the Korean gorals face is distinguishable from that of a foreign mountain goat because its faceline is covered by fur around the neck. The Korean goral weighs between 22 and 40 kilograms, and its body is 82 to 130 centimeter long. Both the male and female have a distinct curved horn about 13 centirneter long. Its fur is grayish brown, and it has a dorsal black spot extending to the tail and a big white spot on the neck, The Korean goral has long, grayish ears and long, mane—like fur from the sides of its forehead down to the neck. Its stocky legs are strong enough that it can leap nearly two meters high, and its sharp hooves are well—suited for climbing rocky hills. The goral is found also in the mountains of China and Russia. In Korea, a population of the species inhabits parts of Mt. Seoraksan, Mt. Odaesan, Daegwallyeong, and Mt. 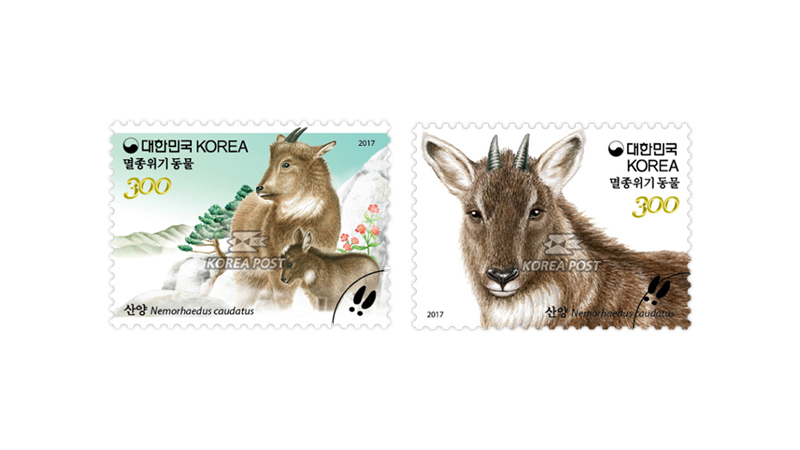 Taebaeksan, Korean gorals live primarily in rugged, rocky mountain regions at elevations of 600 meters or higher. Though the goral sometimes descends to a low elevation area during the winter to find food, it tends to stay in its territory. The female goral gives birth to one or two fawns between April and June. The goral is usually found in a small family group of 2 to 5 and is active in the early morning or late afternoon. It feeds on green leaves or tender sterns, but during the winter when food is scarce, it survives on moss between rocks, coniferous leaves, or woody twigs.